The Blackstone Valley Art Association is proud to be a part of the 2018 Alternatives / Open Sky Community Tapestry Art Show! This show is open to all forms of artistic expression, on all themes. We create a Tapestry of community expression. We showcase watercolors, acrylic paintings, oil paintings, sculptures, pottery, mixed media, drawings, pastels, photography, cyanotypes, and other forms of art. 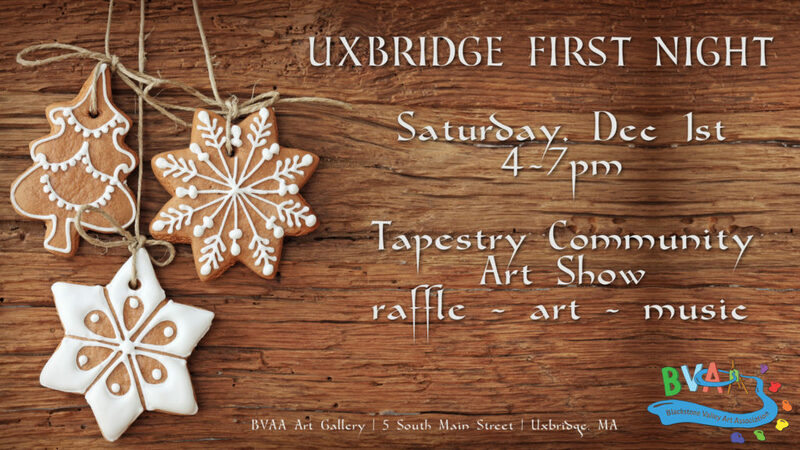 The celebratory reception for our Tapestry Community Art Show is on Saturday, December 1st, 2018 from 4-7pm! This is part of the Uxbridge First Night town-wide celebration! There will be food, music, and all sorts of fun events. Invite family and friends – all are welcome! We’ll have Mark Seagrave – live caricature artist!! Our Community Raffle will be drawn at 6:45pm! All raffle proceeds support the gallery and the Open Sky art workshop projects. Trek Shop in North Grafton is raffling off a coupon for a bike tuneup, worth $99! This coupon is valid through February 28, 2019. If you love your bicycle, be sure to stop by and put in your raffle tickets toward this awesome prize! Share the news about the Tapestry Art Show! And come on out to our fun reception!